Time for a new Challenge over at the House Mouse and Friends Monday Challenge. 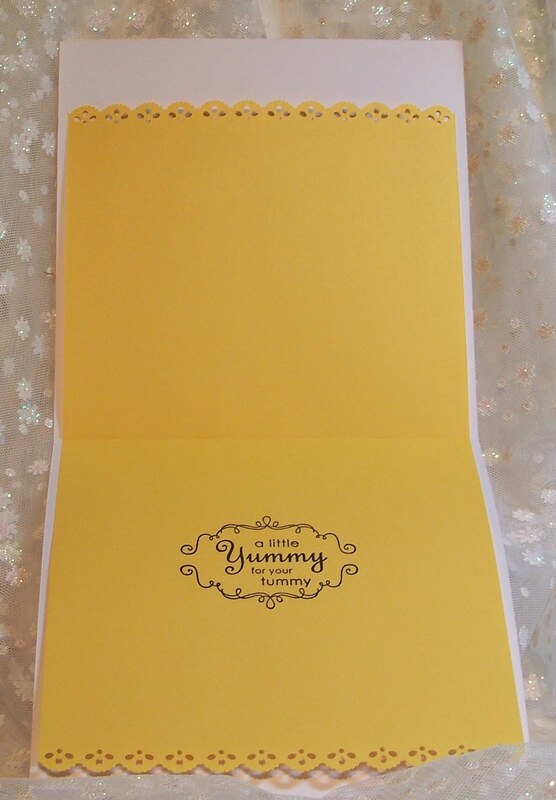 This is challenge # 103 and our talented teamie, Mary, has chosen "A Recipe Card/Project" for our challenge. I made a pocket on the front of my card and slipped my recipe into the pocket. Here is the cake recipe. Preheat the oven to 325 degrees. Grease and flour a 13x9-inch baking pan. Set aside. For the cake, in a large bowl combine the eggs, cake mix and pie filling using an electric mixer. Mix until well blended. Spread into the prepared pan. Bake 30 to 35 minutes, or until a wooden pick inserted in the center comes out clean. 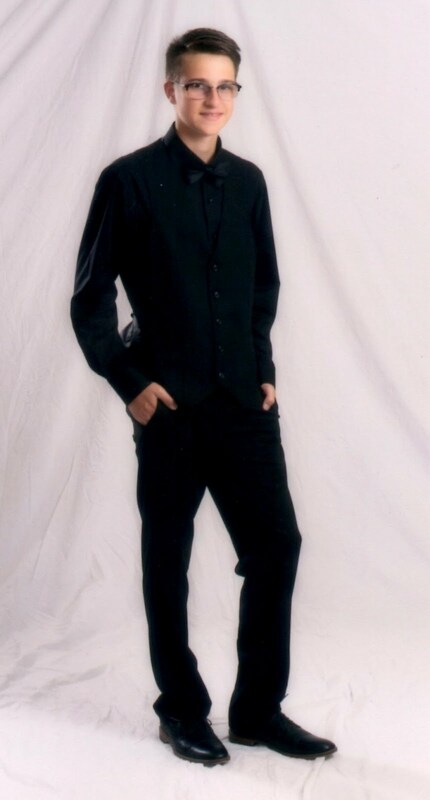 Cool thoroughly. For the icing, in a large bowl mix the cream cheese, milk, vanilla and confectioners' sugar. Spread on the cooled cake. Note: Lemon bars can be made using a 15x10-inch jelly-roll pan. Check doneness after 20 minutes. We have three great Sponsors this week, so three random chances to win! House Mouse Designs has generously offered a $25 electronic Gift Certificate. Pizzazz Aplenty has generously offered a $10 gift package of embellishments. The design team and our two guest DT members for the month of September have some great inspiration on the challenge blog. So get those stamps out and ink them up and join the fun! You gotta be in it to win a prize. Don't forget, you must use a House Mouse design, either the mice, a gruffie bear or a happy hopper bunny to enter. Can't wait to see what you come up with for our Recipe challenge! Thanks Mary this was fun. it's a really beautiful card sue, very cute. 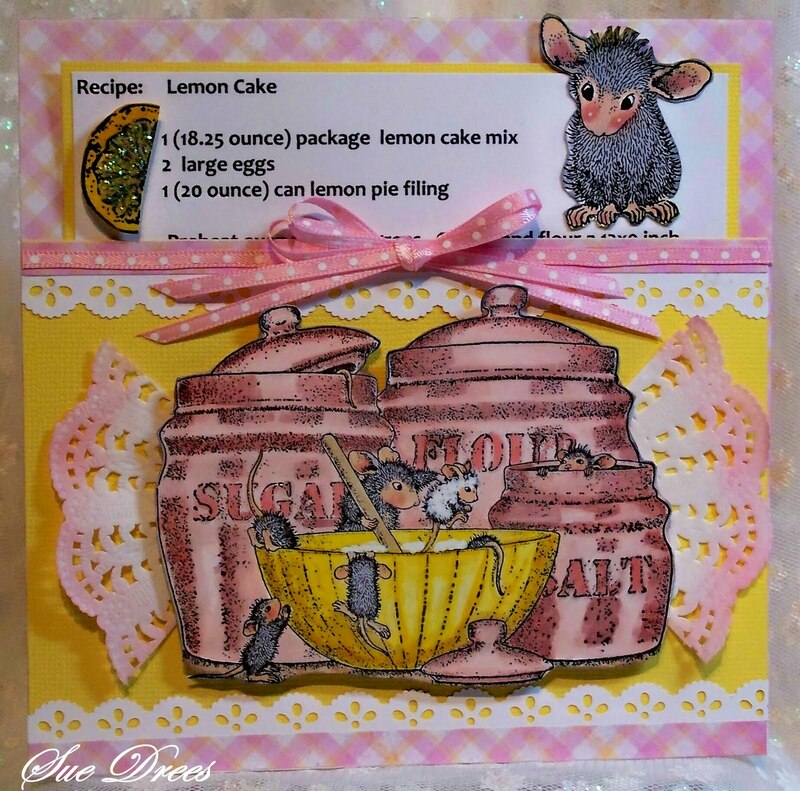 These House Mouse stamps are so cute and this card definitely has a wow factor. Love the recipe challenge. I did one at Christmas a couple of years ago. The recipients really loved getting one of my recipes to add to their collections. Have to get a House Mouse Stamp. They are too cute. 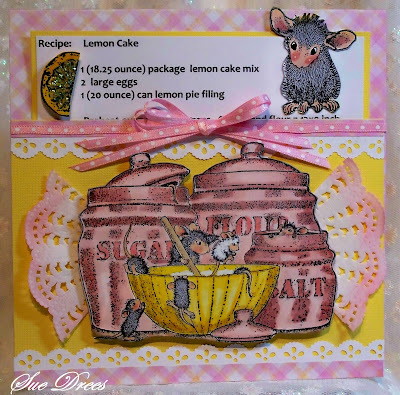 Another adorable House Mouse image!m Great idea to include a recipe. Super colouring. I love anything LEMON! Your image is so darling with the perfect SU sentiment! Such very pretty colors! Sue tis is beautiful, what a great idea and the colors are vibrant! Fabulous job. Sue this a fab creation! Love the image and colouring and that little mousie watching on top is sooo cute! Hi Sue awwww defo a sweet creation..
pun intended..lol cute gorgeous image fab colours love it GF..